Notes: Broadley station is in a tranquil setting, yet it is only a couple of minutes’ walk from the busy Rochdale-Bacup road. It was located on a short level stretch on the almost continuously rising Facit branch; its altitude was 643ft, whilst only a mile in each direction from Broadley, Shawclough was at 574ft and Whitworth at 698ft above sea level. Several hundred yards south of Broadley was Healey Dell Viaduct, the most impressive structure on the Facit Branch, with its eight stone arches rising 105ft above the River Spodden and a further iron span at it southern end over Dell Road. The station had a single platform on the down side of the line. For reasons that are not clear, whilst the other stations on the branch were provided with a stone station building Broadley was not. No photographs or details have been found of what passenger facilities were at the station in its earliest years, but the accompanying photo from the John Alsop collection is thought to date from the 1880s. It shows the original Yardley timber signal box standing between two timber sheds. Sometime in the period 1893 and 1901 Broadley received a small single-storey timber building with a hipped roof containing two rooms and a lean-to, and placed centrally on the platform. In 1915 a standard Size 4 LYR timber signal cabin with a 16-lever frame was added a few yards north of the station building and part of the platform was cut away to accommodate it; this break in the platform can still be seen today. In later years passengers reached the platform through a gate in the retaining wall followed by a flight of steps. In early years before the iron bridge replaced a timber span there was a timber footbridge from the top of the steps, across the line parallel to the road bridge to a wicket gate adjacent to the gate at the top of the goods yard approach road. 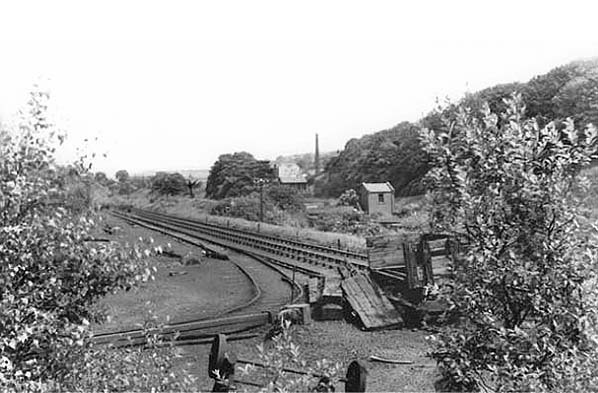 The goods yard at Broadley consisted of a loop and a siding which trailed in at the north end. A 5-ton crane was provided. The loop was the only point on the single track from north of Wardleworth to Facit where trains could pass. The rural setting of the station today belies its past industrial character. Broadley Mill was close to the station and was served by a siding, but this had been disconnected by 1910. Several hundred yards north of the station was Heys Siding (also known as Broadley Stone Siding), installed following an Agreement of 22 October 1886, with a loading bank which served Henry Heys & Co’s stone processing works. A narrow gauge railway (perhaps 2ft-gauge) linked the loading bank with quarries on the moors where fine-grained sandstone was obtained, suitable for pavements, factory and house-building, and for ‘Lonky’ setts for surfacing roads. The works closed c1900, and the tramway and quarry also went out of use. However the loading bank and siding were revived by William Mycock’s Spring Mill dye works (or ‘print works’ according to the OS map), use of the siding being formalised by an Agreement with the LYR on 5 October 1918. 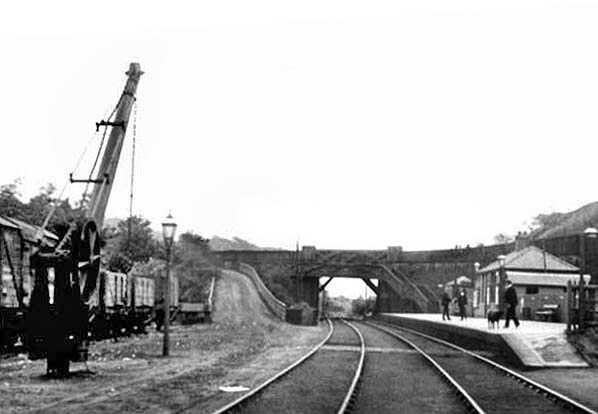 Mycock had installed a 3ft-gauge railway connecting the works and the loading bank before 1910. The narrow gauge line was at right angles to the Facit Branch, stretching about 300yd along the bottom of Prickshaw Valley. It is not known when the narrow gauge railway ceased to be used, but the siding and loading bank were closed in 1955/56. The dye works was later closed and demolished. In World War II (c1942) further industrial activity arose between Broadley station and Healey Dell Viaduct when some sidings (possibly four) were installed east of the Facit Branch to serve an explosives factory in the valley below the viaduct. Anecdotal evidence suggests that a daily train for workers in the munitions factory travelled each way between the Wigan area and Broadley. It is recorded elsewhere that there were such trains to the Chorley/Euxton munitions factories from Wigan area stations.The Healey Dell munitions factory and sidings were closed after the war, and a plan was issued in 1946 for the recovery of the rails. The area formerly occupied by the sidings is still visible though covered by woodland. During World War 2 the services between Rochdale and Bacup remained fairly frequent although at irregular intervals: a feature of the timetable since the early days of the line. In July 1943 trains left Rochdale for Bacup at the following times: 7.00 and 9.25am; 12.05pm, 1.25, 4.20, 6.30 (Saturday excepted [SX]), 6.45 (Saturday only [SO]) and 8.17. Trains called at all Rochdale–Bacup stations apart from the Saturday-only 10.40pm ex-Rochdale which did not stop at Broadley. Trains departed from Bacup for Rochdale at 6.41, 7.17, 8.07 and 9.37am; 12.48 (SO), 1.30, 2.07, 3.13 (SO), 4.45 (SO), 5.12 (SX), 5.52, 6.25 (SO) and 7.44. No passenger trains ran on Sunday. Passenger services were suspended at Broadley and the other Facit Branch stations by the London, Midland & Scottish Railway in June 1947, and the closure was made permanent by British Railways’ London Midland Region in December 1949, but goods traffic continued to be handled until September 1952. 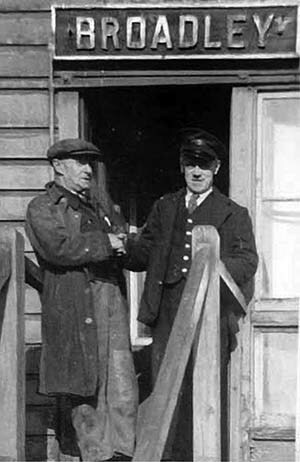 Broadley signal box was closed on 10 November 1956 after which the branch north of Wardleworth signal box was operated under ‘One Engine in Steam’ regulations. Although the building and signal cabin were removed, the platform remained in place and today it is the only one on the branch to survive. Rochdale and Whitworth local authorities had the vision to create the Healey Dell Nature Trail, which opened to the public in July 1972 and includes the station site, Healey Dell Viaduct and about a mile of the railway trackbed. A visit to this tranquil and delightful spot is strongly recommended. Broadley station, looking south-west, c1904. For reasons unknown this station was the only one on the Facit Branch of 1870 not to have a stone station building. Instead it received humble timber sheds. 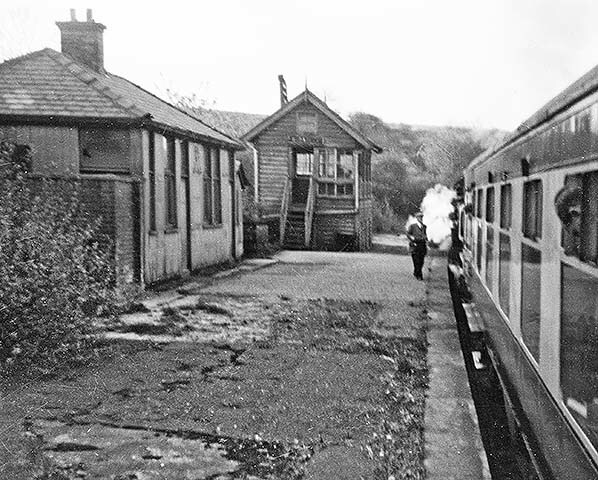 Two sheds are seen here with the original 1870 signal box between them; in 1915 the box would be replaced with one further north on the platform, beyond the right-hand edge of this photograph. Access to the platform is by means of the timber footbridge, adjacent to the road bridge, and the way in to the station was at the southern end of the goods yard. The single loop-line is in the foreground and the goods yard is behind the photographer. Commenting on this photograph, Littleworth (2014) draws attention to the early 4-arm signal; the top two arms appear to the up and down ‘main line’ through the platform and the lower ringed arms apply to the through siding loop on the left. The signal follows early practice in that it is not positioned where trains were expected to stop if the relevant signals were ‘on’; the drivers’ route knowledge was expected to suffice in this respect. 1910 1: 2,500 OS map. By 1901 the station building seen on this map has been provided on the platform at Broadley, replacing diminutive buildings shown on the OS 1: 2,500 map of 1893 (not reproduced here) and a signal cabin is also on the platform towards its southern end. There is a loop on the up side as well as two sidings and a crane. At one time a siding served Broadley Mill north-east of the station; the outline of the building is shown, but it is not named. Broadley Wood Mill (not rail-connected) is north-west of the station. Click here for a larger version. 1929 1: 2,500 OS map. On this map Broadley Stone Siding, located several hundred yards north of the station, is seen in the second phase of its use. From 1886 until c1900 this was the point where stone, brought down from the moors to the west on a tramway and then shaped, was dispatched via the Facit Branch. The course of this tramway can be inferred from the map as its cuttings and embankments remain in place (for example close to field number 886.901). By 1910 the 3ft-gauge tramway shown on this map had been laid to connect Spring Mill Print Works with what continued to be known as Broadley Stone Siding loading bank; however the formal Agreement with the Lancashire & Yorkshire Railway to use the siding was not completed until 1918. It is not known when this tramway ceased to be used, but the siding and loading bank closed in 1955/56. 1929 1:2,500 OS map. Broadley station’s signal cabin is now north of the station building. Broadley Wood Mill has closed. 1960 1: 2,500 OS map. Only the running line and loop are now in place at Broadley station and the buildings have been removed from the platform. It is surprising that the station is named as it has been closed to all traffic since 1952. Both of the Broadley mills have been demolished. Click here for a larger version. Broadley station looking south c1910. The single-storey station building was constructed sometime between 1893 and 1901. At this time the signal cabin is still in its original position beyond the main building; in 1915 a new cabin would be placed on the near side of the station building. Access to the platform is from the upper end of the sloping track, via the timber footbridge placed alongside the road bridge. The photographer is standing with the loop line immediately to his left and a siding beyond, where a rake of mineral wagons is seen. The 5-ton yard crane is in the foreground. 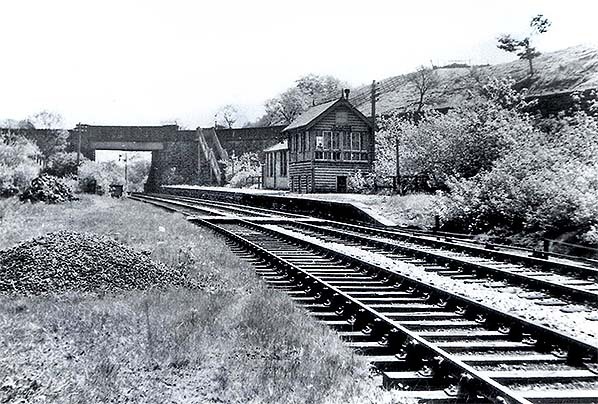 Broadley station, looking south in May 1955. Although the station had closed to goods traffic in 1952 the platform with its single-storey timber building and accompanying signal box, constructed of the same material, are still in place. At this point there was a passing loop (in the foreground) as well as the ‘main’ line. In the background it will be seen that access to the platform is by means of a staircase from the east side of Station Road bridge. 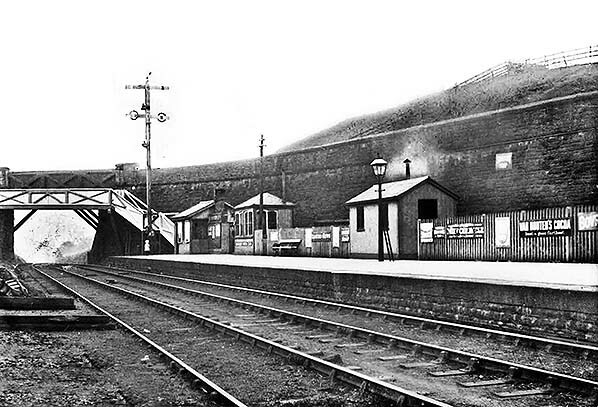 In earlier years passengers used a timber footbridge adjoining the road bridge to reach the platform. Several hundred yards north of Broadley station was Heys Siding (also known as Broadley Stone Siding) with a loading bank which served Henry Heys & Co’s stone processing works. A narrow gauge railway (perhaps 2ft-gauge) linked the loading bank with quarries on the moors. The works closed circa 1900, and the tramway and quarry also went out of use. However the loading bank and siding were revived by William Mycock’s Spring Mill dye works (or ‘print works’ according to the OS map), use of the siding being formalised by an Agreement with the LYR on 5 October 1918. Mycock installed a narrow gauge railway connecting the works and the loading bank. The narrow gauge line was at right angles to the Facit Branch, stretching about 300yd along the bottom of Prickshaw Valley. In this photograph of July 1955 looking north, the line to the dye works is seen in the foreground curving tightly away from the Facit Branch. It is not known when the narrow gauge railway ceased to be used, but the siding and loading bank were closed in the 1950s. 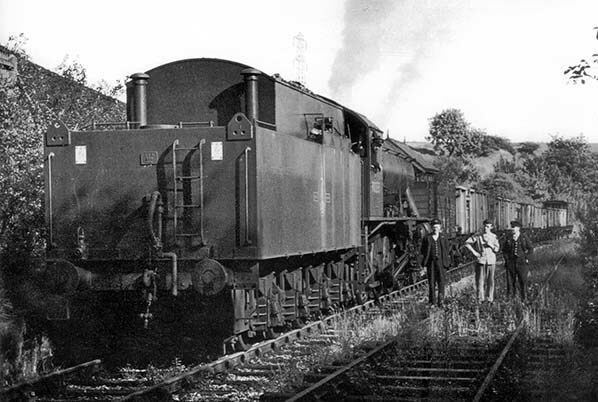 On 12 May 1956 the Stephenson and Manchester Locomotive societies’ ‘Old Manchester Rail Tour’ visited the Rochdale – Facit branch; only one call was made, at Facit, which by that time was the northern terminus of the goods-only route. This northward view from the train shows it passing through Broadley station. The station building, of timber construction and with a hipped roof, is quite unlike the main buildings at the line’s other stations. It was constructed sometime between 1893 and 1901.The signal cabin is a standard Lancashire & Yorkshire design with 14 levers, constructed in 1915 to replace the original one which was also on the platform but further south. 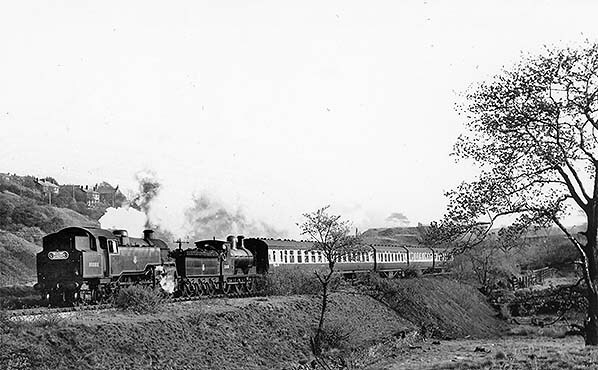 Looking south-east on the early evening of 12 May 1956, the SLS/MLS ‘Old Manchester Rail Tour’ is seen at Broadley Stone Siding, on its way to Facit, headed by Nos.80088 and 52438. The train consists of five LMS open saloon coaches. No.80088, 4MT 2-6-4T is nearly new, built at BR(S) Brighton works in July 1954 and based at 26D, Bury shed. Elderly No.52438 is Aspinall Class LYR27 0-6-0 built in May 1906 at the LYR Horwich works. She would be withdrawn in April 1962 from 7D, Rhyl shed, and disposed of at Crewe works three months later. No.80088 survived until 1965 when she was withdrawn from 75B, Redhill shed, on 13 June; she was cut up in October of that year by Birds, Morriston (Swansea). WD (‘Austerity’) 2-8-0 No.90555 on goods duties is seen at Broadley station, looking north in August 1961. The platform is visible in the left foreground and the roof of the signal box is just beyond the loco’s smokebox. The crew (and others) are apparently in no hurry as they find time to pose for a photograph. The Riddles-designed loco was built 1943-45 at an unknown location. After being allocated first to 64A, St Margarets shed (Edinburgh) in 1948 she was eventually withdrawn from 26B, Agecroft shed, in June 1964 and cut up six months later by the Central Wagon Co, Ince, Wigan.